In early discussions about the future of Hidden Creek Country Club, members of the Reston Association’s Board of Directors and community advocates stood firm against the redevelopment of the golf course as its new owner, Wheelock Communities, contemplates future redevelopment options. Since purchasing the golf course in October last year, Wheelock has held three work group sessions with community groups and nearby residents to discuss plans for the site. At its last meeting, the real estate developer of master planned communities pitched four options, including a no-build alternative. Discussions are preliminary. Concerns about future redevelopment intensified when Wheelock Street Capital, an affiliated company, purchased Charter Oak Apartments in partnership with local investment firm Canandaigua & Pratt Holdings in February. The apartment is next to the golf course. At an RA board meeting Thursday night, members reiterated that Reston is a two-golf course community. 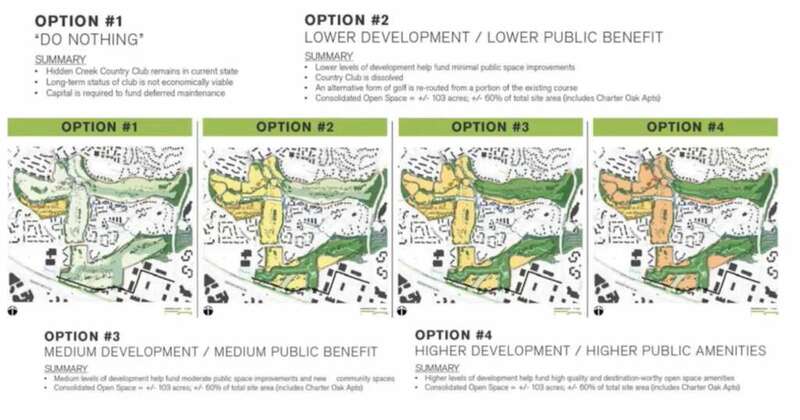 Reston’s Master Plan emphasizes the importance of preserving Reston’s golf courses for private recreational use and an RA resolution commits to ensuring Reston is a golf course community and opposes any attempts to create a roadway between American Dream Way and Isaac Newtown Square through the property. Sherri Hebert, an RA board member, said Wheelock has pitched ways redevelopment could improve public accessibility through additional walking paths and make it more environmentally friendly. Hebert said the club is already “a community diamond” and that the future of golf is strong. “They’ve even used Bob Simon and his vision to take about this is to be envisioned as something different, which I personally find insulting,” Hebert said. The discussion harkens back to Rescue Reston’s defense of Reston National Golf Course, which was threatened by development plans several years. Connie Hartke, president of Rescue Reston, a grassroots group formed in 2012 in response to threats against the golf course, said the group is prepared to step up opposition against future development plans. “This is not the time to concede an inch of open space,” Hartke said, noting that more planned development is on the horizon. RA’s board plans to discuss the issue with representatives from Wheelock at a board operations committee meeting in September and a later board meeting that month as well. RA board president Andy Sigle described Thursday’s discussion as preliminary. Sridhar Ganesan, an RA board member, said Wheelock has stated the cost of making improvements to the golf course raises questions about the future viability of the site. Ganesan said he hopes to see an analysis by Wheelock to determine how that conclusion was reached. notions about the future of the property. This story was updated on Monday (July 30) to include Wheelock’s response.